The address locator style is the template for an address locator. 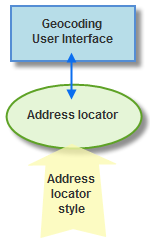 An address locator is created based on a specific locator style. Once created, an address locator contains the geocoding properties and parameters that are used in the geocoding processes, components that direct how an address is parsed, a snapshot of the address attributes in the reference data, and the criteria for performing a geocoding search. The address locator also directs the geocoding engine to perform parsing the address, matching of an address against the found candidate, and reverse geocoding an address. Addresses consist of specific components referred to as address elements. Each address locator style requires that the address information being searched is presented based on some guidelines. Some styles require that the address elements be separated into individual fields in a table. Address locator styles are not limited to street address geocoding. There are other locator styles that can be used for finding places, landmarks, ZIP Codes, or city names. Customized locator styles can also be developed for finding locations based on specific locational systems, such as national grid coordinates, GPS positions, or borehole identifiers. ArcGIS comes with several predefined address locator styles that you can use to create address locators. These address locator styles cover some of the most common address formats. Each address locator style has specific requirements for the reference data that it can use to match addresses. If a locator is specified with predefined x,y minimums and maximums for each feature from the reference data, the Zoom To command for the found locations in the Find dialog box, Geocoding toolbar, or Interactive Rematch dialog box will use these values from the locator as the extent to which to zoom. The ArcGIS Online World Geocoding Service, for example, contains these predefined values. The following four elements define the extent of the feature. You can create these fields and assign the values in your reference data. They can be in latitude-longitude coordinates or projected values that are in the same spatial reference of the reference data. You can specify these fields when you create the address locator. If these fields are not specified, the default zoom scale defined by ArcMap is used. The reference data discussed above is the primary reference data, which is required to store at least one set of address attributes for each feature. However, a feature can be referred to by many names. For example, the official name for a street is 27th Street, but people may still refer to it as Old County Road 30. In cases where features have multiple names, each alternate name can be stored in a different reference table. The records in the table are joined to the primary reference data. Address locator styles specify elements in the alternate name table. Similarly, people frequently know the common name of a location or landmark but don't know its address. For example, many people may know where Mercy Hospital is, but they don't know that its address is 500 E. Market St. To enhance the capability of finding an address of a landmark or a place known by its common name, the location can be searched either by its place-name alias or its address. The address locator style specifies the elements in a table containing the location or alias name as well as the address for each name. Both alternate name and place-name alias tables are optional when creating the address locator. Address locators created in the current version of ArcGIS support finding an individual address in a single-line format. The address locator style indicates the input format and searches for the address against the locator accordingly. When geocoding a table of addresses, each address locator style has different requirements for the information that tables of addresses must contain to be geocoded. The input addresses in the table can be presented in a single field or are required to be broken down into different fields.